POPULAR EQUIPMENT GROUP Carpet Floor Covering, Front Floor Mats, SiriusXM Satellite Radio, For More Info, Call 800-643-2112, No Satellite Coverage HI/AK/PR/VI, 1-Year SiriusXM Radio Service, POWER & REMOTE ENTRY GROUP Premium Vinyl Door Trim w/Map Pocket, Power Windows w/Front 1-Touch Down, Remote Keyless Entry w/All-Secure, Exterior Mirrors w/Heating Element, Power Locks, Black Exterior Mirrors, Power Heated Fold-Away Mirrors, CHROME APPEARANCE GROUP Body Color Upper Fascia, Bright Rear Bumper, Bright Grille, Wheels: 17 x 7 Aluminum, Bright Front Bumper, REAR SLIDING WINDOW, RADIO: UCONNECT 3.0 Integrated Voice Command w/Bluetooth, TRANSMISSION: 8-SPEED AUTOMATIC (845RE) (STD), ENGINE: 3.6L V6 24V VVT (STD). POPULAR EQUIPMENT GROUP Remote Keyless Entry w/All-Secure, SiriusXM Satellite Radio, For More Info, Call 800-643-2112, No Satellite Coverage w/AK/HI/PR/VI/GU, 1-Year SiriusXM Radio Service, RADIO: UCONNECT 3.0 Integrated Voice Command w/Bluetooth, TRANSMISSION: 8-SPEED AUTOMATIC (845RE) (STD), QUICK ORDER PACKAGE 22J EXPRESS Engine: 3.6L V6 24V VVT, Transmission: 8-Speed Automatic (845RE), Front Fog Lamps, Ram 1500 Express, Body Color Grille, Body Color Rear Bumper w/Step Pads, Rear Floor Mats, Body Color Front Fascia, Front Floor Mats. Highlights of this 2019 Ram 1500 Classic Express include: FUEL EFFICIENT 23 MPG Hwy/16 MPG City! iPod/MP3 Input, Back-Up Camera, QUICK ORDER PACKAGE 22J EXPRESS, EXPRESS VALUE PACKAGE, TRANSMISSION: 8-SPEED AUTOMATIC (845R. 4x4, ENGINE: 3.6L V6 24V VVT. EXPRESS VALUE PACKAGE Remote Keyless Entry w/All-Secure, Radio: Uconnect 3 w/5 Display, 5.0 Touchscreen Display, Overhead Console, Rear View Day/Night Mirror, GPS Antenna Input, Temperature & Compass Gauge, Integrated Voice Command w/Bluetooth, SiriusXM Satellite Radio, For More Info, Call 800-643-2112, No Satellite Coverage w/AK/HI/PR/VI/GU, 1-Year SiriusXM Radio Service, Wheels: 20 x 8 Aluminum Chrome Clad, Tires: P275/60R20 BSW AS, Full Size Temporary Use Spare Tire, Rear Floor Mats, Front Floor Mats, QUICK ORDER PACKAGE 22J EXPRESS Engine: 3.6L V6 24V VVT, Transmission: 8-Speed Automatic (845RE), Front Fog Lamps, Ram 1500 Express, Body Color Grille, Body Color Rear Bumper w/Step Pads, Rear Floor Mats, Body Color Front Fascia, Front Floor Mats. 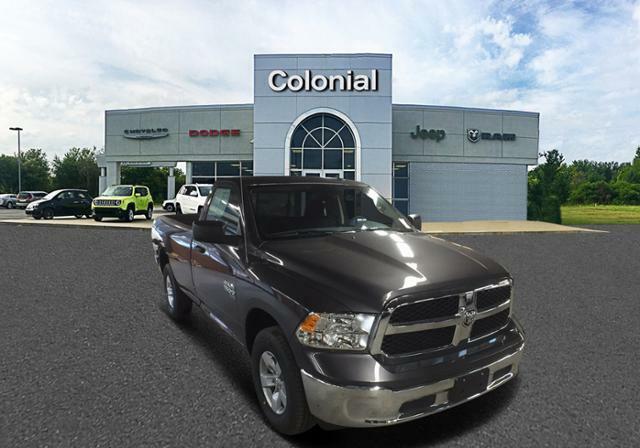 Highlights of this 2019 Ram 1500 Classic Express include: Back-Up Camera, iPod/MP3 Input, EXPRESS VALUE PACKAGE, QUICK ORDER PACKAGE 22J EXPRESS, EXPRESS BLACK ACCENT PACKAGE, 4x4, ENGINE: 3.6L V6 24V VVT, TRANSMISSION: 8-SPEED AUTOMATIC (845R. FUEL EFFICIENT 23 MPG Hwy/16 MPG City! EXPRESS VALUE PACKAGE Remote Keyless Entry w/All-Secure, Radio: Uconnect 3 w/5 Display, 5.0 Touchscreen Display, Overhead Console, Rear View Day/Night Mirror, GPS Antenna Input, Temperature & Compass Gauge, Integrated Voice Command w/Bluetooth, SiriusXM Satellite Radio, For More Info, Call 800-643-2112, No Satellite Coverage w/AK/HI/PR/VI/GU, 1-Year SiriusXM Radio Service, Wheels: 20 x 8 Aluminum Chrome Clad, Tires: P275/60R20 BSW AS, Full Size Temporary Use Spare Tire, Rear Floor Mats, Front Floor Mats, TRANSMISSION: 8-SPEED AUTOMATIC (845RE) (STD), QUICK ORDER PACKAGE 22J EXPRESS Engine: 3.6L V6 24V VVT, Transmission: 8-Speed Automatic (845RE), Front Fog Lamps, Ram 1500 Express, Body Color Grille, Body Color Rear Bumper w/Step Pads, Rear Floor Mats, Body Color Front Fascia, Front Floor Mats, EXPRESS BLACK ACCENT PACKAGE Black RAM Head Tailgate Badge, Body Color Grille w/Black RAM's Head, Black Headlamp Bezels, 4x4 Flat Black Badge, Tires: P275/60R20 BSW AS, Black Exterior Truck Badging, Full Size Temporary Use Spare Tire, Semi-Gloss Black Hub, Wheels: 20 x 8 Semi-Gloss Black Aluminum. Highlights of this 2019 Ram 1500 Classic Express include: Back-Up Camera, iPod/MP3 Input, TRANSMISSION: 8-SPEED AUTOMATIC (845R. QUICK ORDER PACKAGE 22J EXPRESS, EXPRESS VALUE PACKAGE, 4x4, ENGINE: 3.6L V6 24V VVT, ANTI-SPIN DIFFERENTIAL REAR AXLE. FUEL EFFICIENT 23 MPG Hwy/16 MPG City! EXPRESS VALUE PACKAGE Remote Keyless Entry w/All-Secure, Radio: Uconnect 3 w/5 Display, 5.0 Touchscreen Display, Overhead Console, Rear View Day/Night Mirror, GPS Antenna Input, Temperature & Compass Gauge, Integrated Voice Command w/Bluetooth, SiriusXM Satellite Radio, For More Info, Call 800-643-2112, No Satellite Coverage w/AK/HI/PR/VI/GU, 1-Year SiriusXM Radio Service, Wheels: 20 x 8 Aluminum Chrome Clad, Tires: P275/60R20 BSW AS, Full Size Temporary Use Spare Tire, Rear Floor Mats, Front Floor Mats, ANTI-SPIN DIFFERENTIAL REAR AXLE, TRANSMISSION: 8-SPEED AUTOMATIC (845RE) (STD), QUICK ORDER PACKAGE 22J EXPRESS Engine: 3.6L V6 24V VVT, Transmission: 8-Speed Automatic (845RE), Front Fog Lamps, Ram 1500 Express, Body Color Grille, Body Color Rear Bumper w/Step Pads, Rear Floor Mats, Body Color Front Fascia, Front Floor Mats. Highlights of this 2019 Ram 1500 Classic Express include: Back-Up Camera, iPod/MP3 Input, EXPRESS VALUE PACKAGE, QUICK ORDER PACKAGE 22J EXPRESS, EXPRESS BLACK ACCENT PACKAGE, 4x4, ENGINE: 3.6L V6 24V VVT, TRANSMISSION: 8-SPEED AUTOMATIC (845R. EPA 23 MPG Hwy/16 MPG City! Highlights of this 2019 Ram 1500 Classic Tradesman include: EPA 23 MPG Hwy/16 MPG City! Back-Up Camera, iPod/MP3 Input, 4x4, TRANSMISSION: 8-SPEED AUTOMATIC (845R. CHROME APPEARANCE GROUP, POPULAR EQUIPMENT GROUP, Bed Liner, Tow Hitch, ENGINE: 3.6L V6 24V VVT. CHROME APPEARANCE GROUP Bright Rear Bumper, Bright Grille, Wheels: 17 x 7 Aluminum, Bright Front Bumper, TRANSMISSION: 8-SPEED AUTOMATIC (845RE) (STD), POPULAR EQUIPMENT GROUP Remote Keyless Entry w/All-Secure, Carpet Floor Covering, Rear Floor Mats, Front Floor Mats, SiriusXM Satellite Radio, For More Info, Call 800-643-2112, No Satellite Coverage w/AK/HI, 1-Yr SiriusXM Radio Service. Highlights of this 2019 Ram 1500 Classic Express include: Back-Up Camera, iPod/MP3 Input, 4x4, EXPRESS BLACK ACCENT PACKAGE, QUICK ORDER PACKAGE 22J EXPRESS, EXPRESS VALUE PACKAGE, ENGINE: 3.6L V6 24V VVT, TRANSMISSION: 8-SPEED AUTOMATIC (845R. EPA 23 MPG Hwy/16 MPG City! WHEELS: 20 X 8 ALUMINUM CHROME CLAD Tires: P275/60R20 BSW AS, Full Size Temporary Use Spare Tire, ENGINE: 3.6L V6 24V VVT (STD), TRANSMISSION: 8-SPEED AUTOMATIC (845RE) (STD), QUICK ORDER PACKAGE 22J EXPRESS Engine: 3.6L V6 24V VVT, Transmission: 8-Speed Automatic (845RE), Front Fog Lamps, Ram 1500 Express, Body Color Grille, Body Color Rear Bumper w/Step Pads, Rear Floor Mats, Body Color Front Fascia, Front Floor Mats, POPULAR EQUIPMENT GROUP Remote Keyless Entry w/All-Secure, SiriusXM Satellite Radio, For More Info, Call 800-643-2112, No Satellite Coverage w/AK/HI/PR/VI/GU, 1-Year SiriusXM Radio Service. Highlights of this 2019 Ram 1500 Classic Express include: Back-Up Camera, iPod/MP3 Input, TRANSMISSION: 8-SPEED AUTOMATIC (845R. QUICK ORDER PACKAGE 22J EXPRESS, POPULAR EQUIPMENT GROUP, 4x4, WHEELS: 20 X 8 ALUMINUM CHROME CLAD. FUEL EFFICIENT 23 MPG Hwy/16 MPG City! Highlights of this 2019 Ram 1500 Classic Express include: FUEL EFFICIENT 23 MPG Hwy/16 MPG City! Back-Up Camera, iPod/MP3 Input, TRANSMISSION: 8-SPEED AUTOMATIC (845R. QUICK ORDER PACKAGE 22J EXPRESS, POPULAR EQUIPMENT GROUP, 4x4, WHEELS: 20 X 8 ALUMINUM CHROME CLAD. Highlights of this 2019 Ram 1500 Classic Express include: EPA 21 MPG Hwy/15 MPG City! Back-Up Camera, iPod/MP3 Input, TRANSMISSION: 8-SPEED AUTOMATIC (8HP7. QUICK ORDER PACKAGE 27J EXPRESS, POPULAR EQUIPMENT GROUP, 4x4, WHEELS: 20 X 8 ALUMINUM CHROME CLAD. ENGINE: 5.7L V8 HEMI MDS VVT. WHEELS: 20 X 8 ALUMINUM CHROME CLAD Tires: P275/60R20 BSW AS, Full Size Temporary Use Spare Tire, ENGINE: 5.7L V8 HEMI MDS VVT, TRANSMISSION: 8-SPEED AUTOMATIC (8HP70), QUICK ORDER PACKAGE 27J EXPRESS Engine: 5.7L V8 HEMI MDS VVT, Transmission: 8-Speed Automatic (8HP70), Front Fog Lamps, Ram 1500 Express, Body Color Grille, Body Color Rear Bumper w/Step Pads, Rear Floor Mats, Body Color Front Fascia, Front Floor Mats, GVWR: 6,900 lbs, POPULAR EQUIPMENT GROUP Remote Keyless Entry w/All-Secure, SiriusXM Satellite Radio, For More Info, Call 800-643-2112, No Satellite Coverage w/AK/HI/PR/VI/GU, 1-Year SiriusXM Radio Service. Highlights of this 2019 Ram 1500 Classic Express include: FUEL EFFICIENT 21 MPG Hwy/15 MPG City! Back-Up Camera, iPod/MP3 Input, TRANSMISSION: 8-SPEED AUTOMATIC (8HP7. QUICK ORDER PACKAGE 27J EXPRESS, POPULAR EQUIPMENT GROUP, 4x4, WHEELS: 20 X 8 ALUMINUM CHROME CLAD. Highlights of this 2019 Ram 1500 Classic Express include: Back-Up Camera, iPod/MP3 Input, TRANSMISSION: 8-SPEED AUTOMATIC (8HP7. QUICK ORDER PACKAGE 27J EXPRESS, POPULAR EQUIPMENT GROUP, 4x4, WHEELS: 20 X 8 ALUMINUM CHROME CLAD. ENGINE: 5.7L V8 HEMI MDS VVT. EPA 21 MPG Hwy/15 MPG City! Highlights of this 2019 Ram 1500 Classic Express include: Back-Up Camera, iPod/MP3 Input, 4x4, POPULAR EQUIPMENT GROUP, QUICK ORDER PACKAGE 27J EXPRESS, TRANSMISSION: 8-SPEED AUTOMATIC (8HP7. WHEELS: 20 X 8 ALUMINUM CHROME CLAD. FUEL EFFICIENT 21 MPG Hwy/15 MPG City! Highlights of this 2019 Ram 1500 Classic Express include: Back-Up Camera, iPod/MP3 Input, TRANSMISSION: 8-SPEED AUTOMATIC (845R. QUICK ORDER PACKAGE 22J EXPRESS, POPULAR EQUIPMENT GROUP, 4x4, WHEELS: 20 X 8 ALUMINUM CHROME CLAD. ENGINE: 3.6L V6 24V VVT. EPA 23 MPG Hwy/16 MPG City! WHEELS: 20 X 8 ALUMINUM CHROME CLAD Tires: P275/60R20 BSW AS, Full Size Temporary Use Spare Tire, ENGINE: 3.6L V6 24V VVT (STD), TRANSMISSION: 8-SPEED AUTOMATIC (845RE) (STD), QUICK ORDER PACKAGE 22J EXPRESS Engine: 3.6L V6 24V VVT, Transmission: 8-Speed Automatic (845RE), Front Fog Lamps, Ram 1500 Express, Body Color Grille, Body Color Rear Bumper w/Step Pads, Rear Floor Mats, Body Color Front Fascia, Front Floor Mats, POPULAR EQUIPMENT GROUP Remote Keyless Entry w/All-Secure, SiriusXM Satellite Radio, For More Info, Call 800-643-2112, No Satellite Coverage w/AK/HI, 1-Yr SiriusXM Radio Service.